START-UP! The final: The 30 winners of the regional project of the Goethe-Institutes in Subsahara-Africa as well as their chaperones and Ebenezer Kumi (SEED) meet up in Berlin for the final and third workshop! Solar-powered drones that assist with the regulation of traffic? A professional enterprise with board games, to offer alternative games to those offered on the smartphone? Electronic bins, which facilitate the separation of waste? With these and other innovative business-ideas, scholars from PASCH-schools (Schools: Partners for the Future) in Burkina Faso, Côte d’Ivoire, Ghana, Malawi, Namibia, Senegal, South Africa and Uganda, together with scholars from Germany, applied for the participation in the START-UP! project. In the context of START-UP! the scholars obtained insight into the world of youth entrepreneurship. How do you develop a sound business-idea? What makes a business-plan a good business-plan? And what does a perfect pitch look like? Two national workshops 2017/2018 imparted the necessary know-how and gave the teams the opportunity to get to know each other and to exchange ideas. The participants received additional motivation through visits to existing start-ups and their success stories. And then it was time to professionally pitch their idea before a jury. A special main prize beckoned and the winning teams of the national competitions are now in Berlin for the final START-UP! workshop. Here, the program includes intercultural German language classes related to the start-up topics, discussions and exchange of business ideas of the winning teams of all participating countries as well as internships over a 3-day period at start-up-companies in Berlin. Of course, regional tours to discover Berlin, its people and culture are also part of the program: taking a boat trip down the Spree is a journey of discovery and gives an opportunity to taste a typical German “Bretzel”, following the steps of Frederick the Great at the palace “Sans Souci” and much more. The German scholars of the Tilman-Riemenschneider-Gymnasium in Osterode are the appointed “Junior-PASCH Ambassadors”. 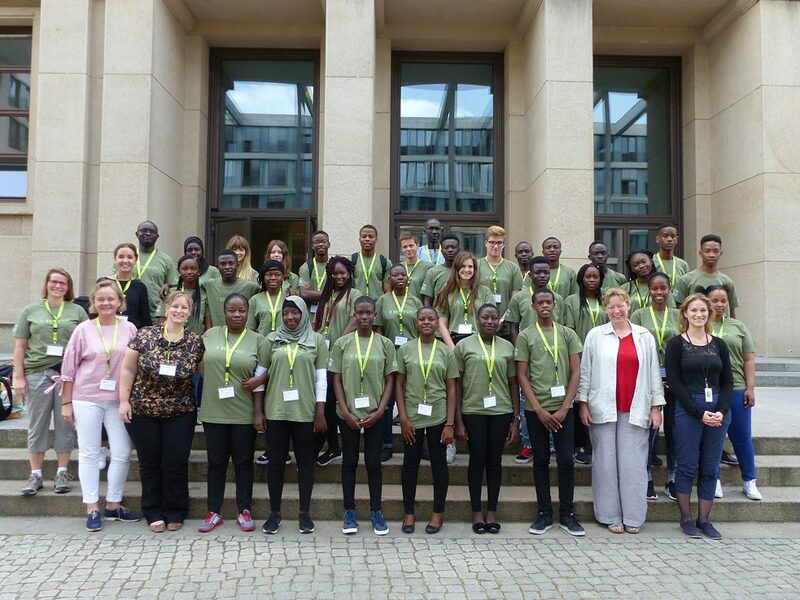 They guide their African guests with the assistance of 2 alumni from Uganda, now residing in Berlin, through Berlin to show them this wonderful city through the eyes of teenagers. This special tour will be accompanied by the PASCH-Mobil. A visit to the Ministry of Foreign Affairs afforded a chance to have a look behind the scenes and to extend their gratitude for the opportunity to participate in such extensive project. They were greeted by Mrs Bennemann and Mrs Böhm who gave a detailed presentation of the PASCH-network and the scholars were then asked to present their business ideas to them. Multilingualism and cultural diversity are the essence of START-UP! which offers a unique opportunity to learn not only German, about the culture and people but also from each other. …From the youth for the youth!